I am excited by what this find opens up for my painting. There's so much to explore and discover. 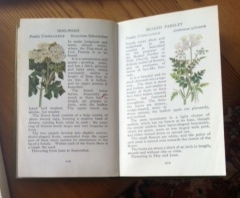 For example, the illustrations were taken from Sowerby's English Botany. James Sowerby studied at the Royal Academy and started his series of 2592 hand-coloured engravings in 1790. We didn't have access to the internet back in the early 1960s but we were given access to these images through the humble Observer's Book. I hadn't realised the quality of what I was looking at. I tried out a new direction for recent colour work, based on the Observer's illustrations. The page spreads alternated colour with black-and-white images.